“The Moody Blues Story” is a two record-set with a collection of Moody Blues songs up to 1978. This particular release was manufactured in France for distribution in the Netherlands. This entry was posted in Acid / Psych Rock, Pop Music, Prog Rock, Rock Music, Vinyl Records and tagged Moody Blues on March 28, 2019 by vinylmeister. “Shades of Deep Purple” is the first official full length album released by the British Rock band “Deep Purple”. The sound of their first album is psychedelic and progressive rock as was this sound in Great Britain during the late 1960s. “The combined talents of five young men are here extended to create realms of musical colour such as have never been heard before on record in `Shades Of Deep Purple’.” — So read the original, endearingly naive, sleeve notes on the first edition of this album, issued on Parlophone way back in September 1968. Now, almost a decade on, it’s interesting to look back on and listen once again to Deep Purple’s premier platter. Although ‘progressive’ at the time of its release, today ‘Shades Of’ sounds raw, basic and extremely formative. But, all the same, its entertainment value has not diminished one bit over the years. This LP features the familiar musical triangle of Ritchie Blackmore (guitar, ex-Screamin’ Lord Sutch’s Savages and Mike Berry And The Outlaws), Jon Lord (organ, fresh from the Artwoods) and Ian Paice (drums, late of Georgie And The Rave Ons, would you believe), as well as two lesser-known Purple members, vocalist Rod Evans and bassist Nic Simper. A band ‘formed almost overnight from handpicked musicians’, great things were expected of Deep Purple. And they achieved success beyond anyone’s wildest dreams — ‘Shades Of’ acting as the springboard from which they launched themselves into super-stardom. The album contains both original Deep Purple compositions and cover versions of other people’s songs — which, funnily enough, seem to succeed best of all. The band’s interpretation of Billy Joe Royal’s ‘Hush’, also recorded by Joe South, is probably the LP’s outstanding cut, being well-balanced, nicely dramatic, Jon Lord shining above the rest of the band, contributing some fierce organ work. In fact, as a single, ‘Hush’ made it into the US top ten. A balladic ‘Help’ (yep, the very same Lennon—McCartney tune) and a Blackmore—Evans—Lord number ‘Mandrake Root’ follow closely behind in the highspot stakes. ‘Shades Of’ presents Deep Purple in their lightest, brightest, freshest colours — colours that were later to darken and then fade forever. Listen to the album and accept it for what it is, a first recording from a lively, ambitious new band whose musical ideas were blossoming but hadn’t quite reached fruition. This entry was posted in Acid / Psych Rock, Collector Notes, Prog Rock, Rock Music, Vinyl Records and tagged Deep Purple, Prog Rock, Psych/Acid on March 10, 2019 by vinylmeister. 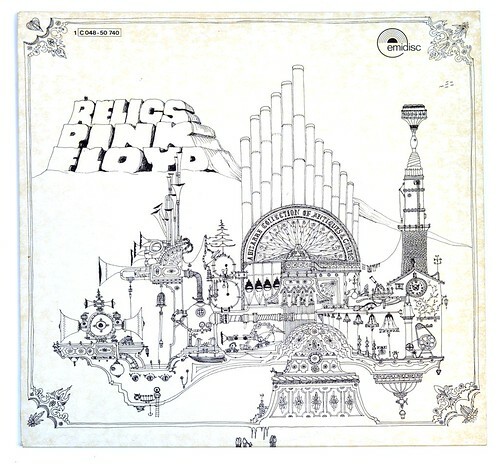 The album’s title “Relics” and the band-name “Pink Floyd” are printed in the upper left of the album cover. The catalognr “1 C 048-50 740” is printed in the top left corner of the front cover. The EMIDISC logo is printed in the top right corner of the album’s front cover. There is NO label code on the record’s label. The rim-text runs from 12 o’clock to 9 o’clock and is printed in the French language. The last words on the rim-text are: “MADE IN FRANCE BY PATHE MARCONI”. This entry was posted in Acid / Psych Rock, Prog Rock, Rock Music, Vinyl Records and tagged Pink Floyd, Syd Barrett on February 11, 2019 by vinylmeister. 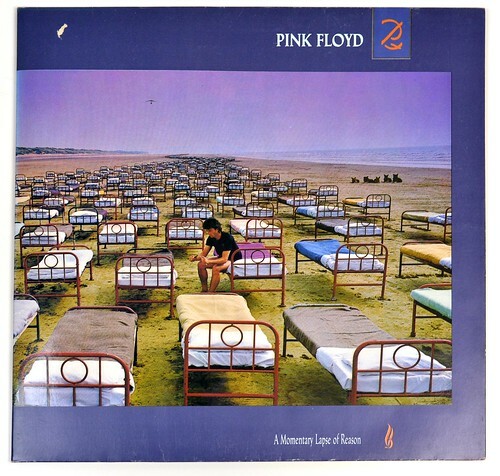 “A Momentary Lapse of Reason” is the thirteenth studio album by English progressive rock group Pink Floyd. It was released in the UK and US in September 1987. In 1985 guitarist David Gilmour began to assemble a group of musicians to work on his third solo album. This entry was posted in Acid / Psych Rock, Prog Rock, Rock Music, Vinyl Records and tagged Pink Floyd on February 10, 2019 by vinylmeister. 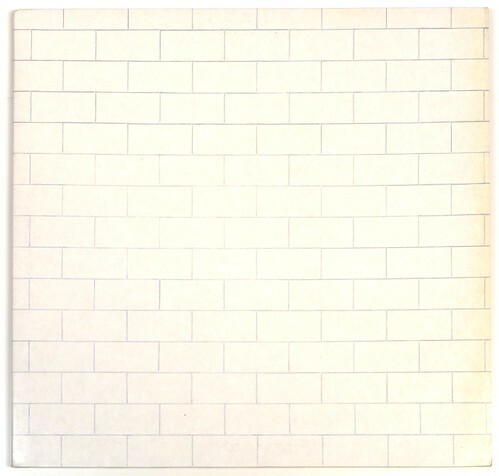 This double LP album “The Wall” comes in a so called gatefold cover, on the front and back cover shows a white brick wall. There is NO catalognr on the album’s back cover. This album comes in light cardboard custom inner sleeves (OIS), each of these with the lyrics of all the songs performed by “Pink Floyd”. This entry was posted in Acid / Psych Rock, Rock Music, Vinyl Records and tagged Pink Floyd on February 8, 2019 by vinylmeister. 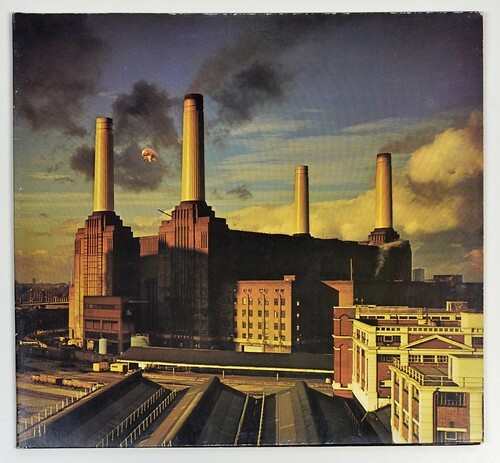 This is the hard to find (rare) release of Pink Floyd’s Animal album which has an uncovered catalognr on the bottom right half of the label. Later releases of this album have this catalognr blacked-out and printed in the upper right half of the record label. Catalognr’s: The catalognrs used for this album look very similar across various releases, however the spacing inside the catalognr is different and may be used to identify the correct version. For example: 064-7 46128 and 064-74 6128. This album comes in a gatefold album cover and a custom inner sleeve (OIS). There is no album-title and no band-name printed on the album cover. There is NO catalognr printed on the album cover. This album comes with a black and white custom inner sleeve. Both pages of the inner sleeve have lyrics of the songs. On one page of the inner sleeve we can see the catalognr near the bottom right corner. The main colours of the label are light blue with the text printed in black. The Right Societies “GEMA” and “STEMRA” are printed on the right bottom half of the record’s label. The catalognr is also printed on the right bottom half of the label. Note: other releases of this album have this catalognr blackened out and printed on upper half of the label. This album was recorded at: Britannia Row Studios, London.